UK, 2003, 115 minutes, Colour. Shirley Henderson, Gerald Lepkowski, Danny Nucci, Dan Hedaya, Stephen Graham. A pleasant family comedy drama set in Glasgow. Actually, it's that kind of Family comedy, two New Jersey mafiosi take refuge with their fish and chip shop owner cousins after a deal goes wrong in the Ukraine. The Ukrainians make contact with their thugs from Liverpool - Eastern European crime lords are doomed if they rely on ineffectual crooks like these. There are also some locals who want to take over the fish and chips shop. This mob is a far more violent and serious menace. Which is not to say that the violence is the main theme of the film. Rather, the two mafiosi turn out to be quite decent chaps (within their vocational limits) and help out in domestic ways as well as a bit of professional know-how. As played by Dan Hedaya and Danny Nucci, they are mostly very genial. On the local scene, Gerard Lepkowski is an obviously nice man, ethical but with a reticent charm. Shirley Henderson helps out at the shop and is in love with the owner. But neither of them say anything until it is almost too late. This is the kind of quirky local film that gets overlooked in the wake of the big blockbusters but which many people would find nicely entertaining (though with the Celtic propensity for for four-letter emphasis), with interesting characters, some good humour and some happy comeuppance for the villains. 1. A small and entertaining comedy? Humorous and serious? 2. The Glasgow settings, the Scottish atmosphere, the city, restaurants, flats and streets? The emphasis on kitchens, restaurants and cooking? The contrast with the United States? The Scots accents? 3. 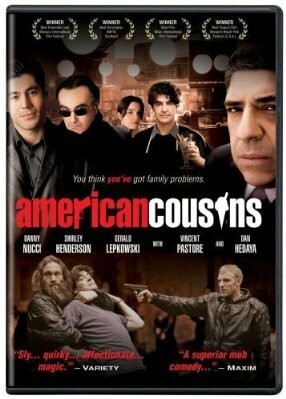 The title, the focus on Roberto, the focus on Settimo and Gino, the American cousins? 4. The American situation: gangsters, deals, the Mafia? Methods? Violence? The deal in Kiev, double-dealings? The need for the Americans to flee? The Americans and the use of local English gangsters? The Russian connections? 5. The contrast with Roberto and his life, with Nonno, in the restaurant? Roberto as a person, his age? His prospects? His manner of speaking, gentle? His relationship with Alice, their work together in the café? Nonno and his age? 6. The arrival of the Americans, the reaction of the Scots? The loud Americans at the airport, coming to see the cousins, moving in? Their fears, going undercover? 7. Gino and Settimo settling into the restaurant life, attempts at cooking, the cooking tests? Gino and his vanity? Alice and her helping? Roberto and his looking askance? The touch of jealousy? 8. The Liverpool thugs, their personalities, manner, throwing their weight around, confronting the Americans, the Americans using their own methods? 9. The Russian Mafia, the Ukraine? Their deals, violence? 10. The Americans, coping? The backup coming to Scotland? The huge number? The confrontation with the thugs? 11. Roberto and Alice, the ups and downs of the relationship, his misunderstanding? Her flirting with the Americans? In the restaurant, at the dance? 12. The happy ending, the Americans and their settling down? The happy ending for the romance for Roberto and Alice?